Your wedding photos will provide memories for a lifetime. When planning for photos you have two basic routes from which to choose. Neither is better than the other, but the results will be different. The first tried and true option is to provide instamatic cameras to the guests and encourage them to snap away.In addition to individuals using their cell phones or personal cameras you will receive numerous spontaneous shots of the ceremony and festivities that a single professional photographer could miss. An astute guest might catch the moment when mutual friends Bill and Sally meet for the first time and sparks fly. There’s a lot happening during the cocktail hour while the photographer is covering the group photos. Each of the instamatics can be developed into thumbprints avoiding the cost of developing blurred or non-descript pictures. Guests can easily edit their phones or cameras and e-mail their best efforts. This DIY route gives your guests a very personal role in your special day. On the other hand, have you attended a wedding where a guest viewed the entire ceremony through the lens of a cell phone instead of being truly present for the event? Some couples are choosing to have ‘unplugged’ ceremonies and receptions. If you have hired a photographer, then let the photographer do their job and let the guests relax and be guests. You wouldn’t expect guests to bring sack lunches when you’ve hired a caterer. You wouldn’t expect guests to plug their phones into the DJs sound system to play the songs they want to hear. I know how I would feel if a couple hired me as their celebrant and then guests commandeered my mic and presided over the ceremony. Your professional photographer needs space to work. A well-meaning guest whipping out a cell phone has marred many a shot. Some photographers are opting to post a selection of photos that guests can download free of charge so they won’t feel they’re missing out. If you choose the unplugged route some care needs to be taken so as not to offend guests when you ask them to turn off their phones and all electronic equipment. Jeffra Trumpower from Wedding Wire suggests using signage at the reception table – something simple and direct but friendly. 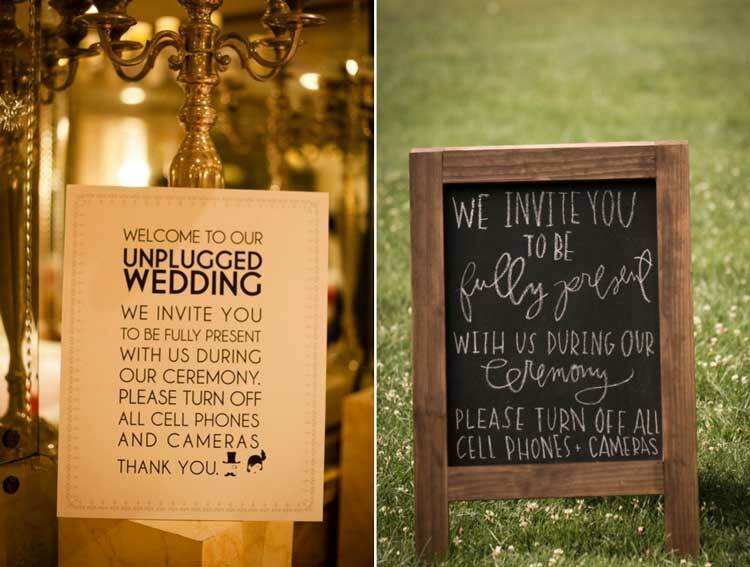 * Specify whether only the ceremony is unplugged or if the request applies to both ceremony and reception. 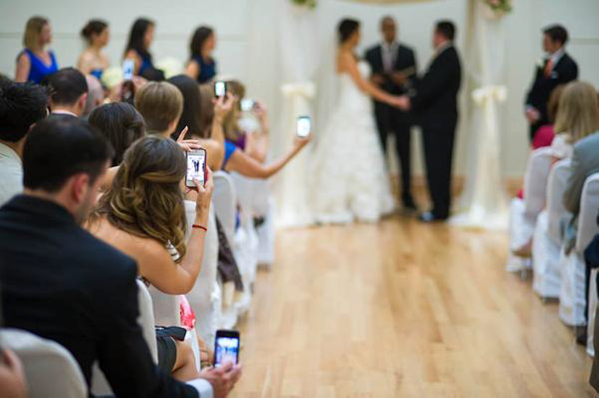 The DJ or the officiant would be happy to make a brief announcement as the ceremony begins reminding guests to put their phones away. You will treasure your wedding photos, reliving tender and precious moments. Your photos will capture the emotion and the festivities of your wedding day. Choose the route that makes you most comfortable and reflects your style.